“1. The primary purpose of this non-profit Association is to maintain and administer the Common Facilities and to collect and disburse the assessments and charges on the Properties and such additions thereto as may be brought within the jurisdiction of the Association, subject to the provisions of any Declaration of Restrictive Covenants and Conditions, including amendments or supplements thereto, which may now exist or hereafter be placed on the Properties. We want to do everything possible to maintain the natural beauty and visual esthetics of our community, and to continually foster a friendly and cooperative atmosphere among our residents. 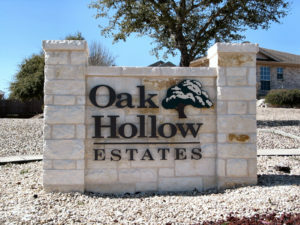 Oak Hollow Estates is located in the beautiful Texas Hill Country on the southeastern edge of the city of Kerrville, TX (approximately 60 miles NW of San Antonio), near the intersection of Highway 173 (Bandera Highway) and Loop 534. It is bordered by Kerrville-Schreiner Park to the east and south, and River Hill subdivision to the west. The area abounds with wildlife, including native white tail deer and many varieties of exotic deer and antelope. Oak Hollow Estates residents enjoy the use of a private clubhouse, swimming pool and a park area for children that contains swings, a slide and other playground equipment. Our community sits at an elevation of approximately 2,000 ft, thus providing great views of the surrounding landscape. Our area consists of 104 home sites, with 99 residences as of May 1, 2015.